It’s at times like these, when it’s cold and miserable and low lying areas are in increasing danger from flash floods, that the best thing we can all do is look forward to something jolly. Well the good news is that Spring isn’t too far off and we can all start looking forward to the joyful colours of spring bulbs and new leaves bursting on the trees. But why stop there? Such seems to have been the thinking of the RHS who in an attempt to brighten up the new year have announced the theme for Britain in Bloom 2014 will be “Growing for Gold”. Perhaps after the success of the Olympic games in 2012, they have high hopes of our sportsmen and women in the winter games in Russia this year. It promises a glowing opening to the gardening year. The theme, which celebrates 50 years of Britain in Bloom, is based around gold coloured, pollinator friendly plants to give a vibrant, life affirming quality to this year’s displays that should be teeming with colour and wildlife. Now, the plants the RHS have most widely espoused are sunflowers, and who can blame them? 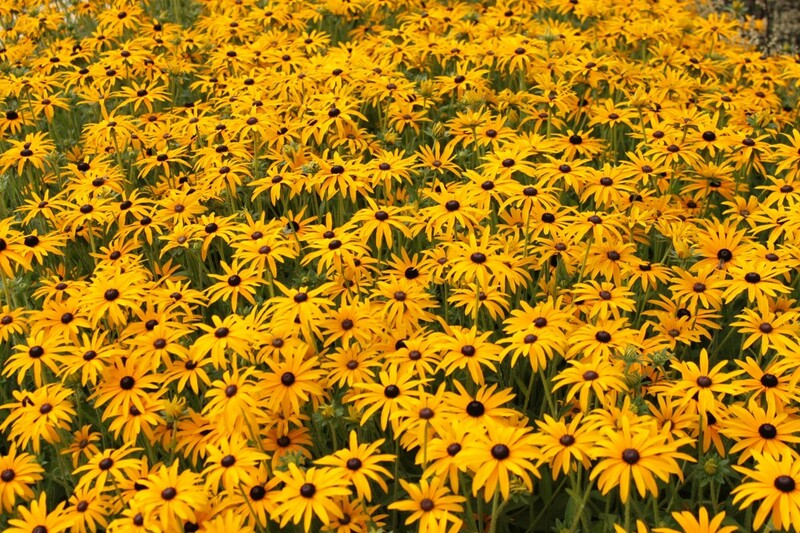 They’re bright, golden, very attractive to pollinators and easy to grow. The varieties suggested are the ‘Giant Single’, ‘Moonwalker’, ‘Vanilla Ice’ and ‘Taiyo’, and all are available in a free seed pack from the RHS website. The wonderful, long flowering Rudbeckia fulgida ‘Goldsturm’, partners with a wide varieties of other plants such as Cotinus coggygria ‘Royal Purple’ or Verbena bonariensis. 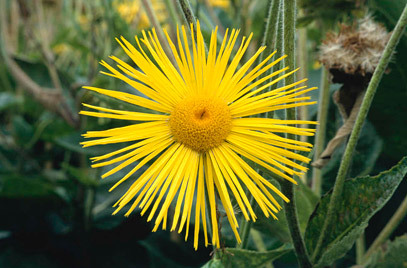 Inula makes a great centre piece in a lightly shaded area. A big, bright yellow flower with fringe like petals that are pleasing to the eye and touch and flower consistently in the summer. They really brighten up a dull corner of the garden. 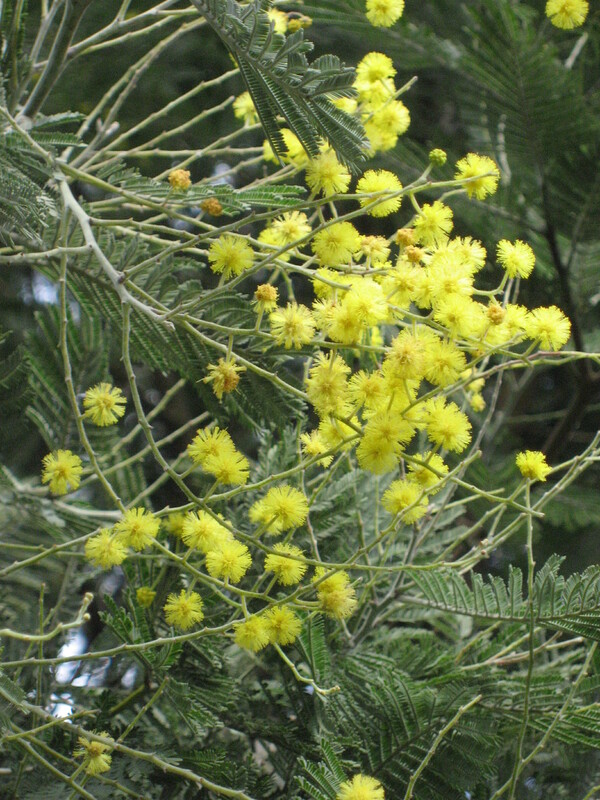 Although only semi-hardy (can cope with temperatures as low as -6o to -8o C), mimosa has been a garden favourite in Southern gardens for many, many years. Ideally grown against a south-west facing wall or in a sunny, sheltered space, they produce a wonderful profusion of golden scented flowers in late winter to early spring. Such as old fashioned shrub, but one with such character. 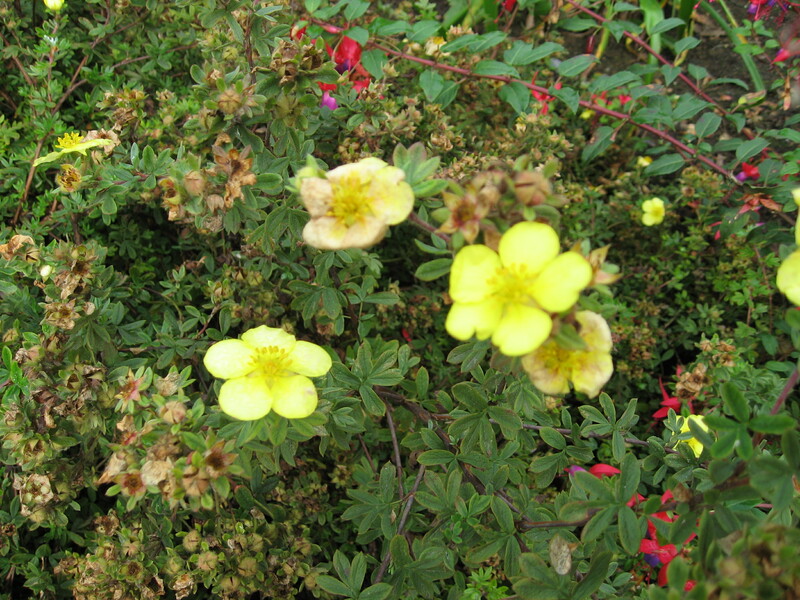 A summer flowering shrub, it produce masses of flowers from June until October. Its open form attract bees in their droves. 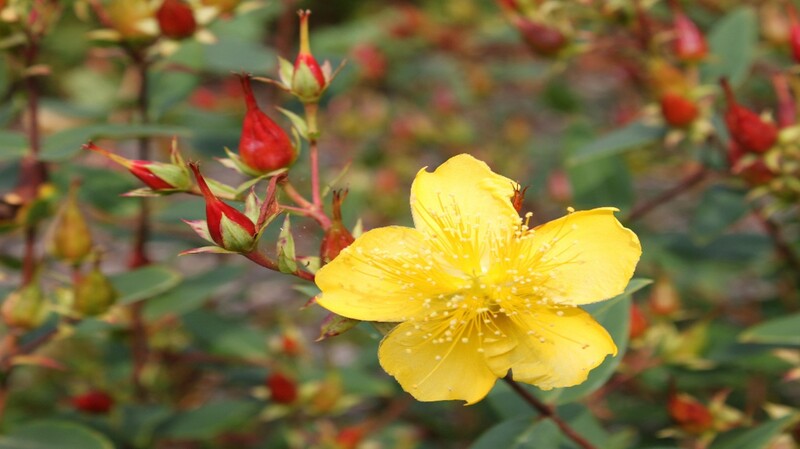 Scarlet buds burst open to show a mass of golden yellow blooms inviting insects to visit them throughout the summer. Dahlia ‘Moonfire’: A bright little flower with golden outer petals that turn to a fiery orange/red in its centre. Ranunculus graminius: Relative of the humble buttercup, this dark foliaged flower will spread across the ground and bloom in little golden droplets to create an attractive lower layer to peer at. Helianthus x multiflorus ‘Meteor’: As the name suggests this plant produces a flurry of yellow/orange flowers that will lend any display a warm, cheery aspect. Artemisia ‘Oriental Twilight’: Not a “bloom” as such, this variegated plant is still a riot of colour with bright golden leaves touched with a hint of green.